Mount Sinai (Arabic: طور سيناء , Hebrew: הר סיני), also known as Mount Horeb, Mount Musa, Gebel Musa or Jabal Musa ("Moses' Mountain"), is the name of a mountain in the Sinai Peninsula that is purported to be the place where Moses spoke to God, saw the burning bush, and received the Ten Commandments. Although the exact location of Mount Sinai is debated, and many mountains have been identified as this biblical site, the most common location is identified as Mount Horeb at 2,285 meters, found across from Mount St. Catherine, the tallest peak in the Sinai. Mount Sinai is one of the world's many sacred places that have inter-faith significance for followers of more than one religion. The mountain still remains a pilgrimage site for Jews and Christians to this day. According to biblical scholars, Sinai most likely derives from the name of Sin, the Semitic lunar deity. In the Hasidic tradition, the name Sinai derives from "sin-ah," (meaning hatred), in reference to the other nations hating the Jews out of jealousy, due to the Jews being the ones to receive the divine laws. The Biblical Mount Sinai is an ambiguously located mountain at which the Old Testament states that the Torah was given to Moses by God. In certain biblical passages, these events are described as having transpired at Mount Horeb, but though there is a small body of opinion that Sinai and Horeb were different locations, they are generally considered to have been different names for the same place. According to textual scholars, the name Sinai is only used in the Torah by the Jahwist and Priestly source, whereas Horeb is only used by the Elohist and Deuteronomist. According to Bedouin tradition, Jebel Musa ("Moses Mountain"), also called Mount Sinai, is the mountain where God gave laws to the Israelites. However, the earliest Christian traditions place this event at the nearby Mount Serbal, and a monastery was founded at its base in the fourth century; it was only in the sixth century that the monastery moved to the foot of Mount Catherine, in response to Josephus' earlier claim the mountain should be the highest in the area. 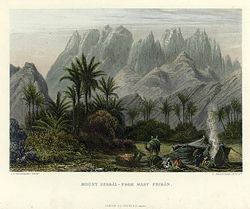 Jebel Musa, which is adjacent to Mount Catherine, was only equated with Sinai by Christians after the fifteenth century. Many modern biblical scholars now believe that the Israelites would have crossed the Sinai peninsula in a straight line, rather than detouring to the southern tip (assuming that they did not cross the eastern branch of the Red Sea/Reed Sea in boats or on a sandbar), and therefore look for Mount Sinai elsewhere. The Song of Deborah, which textual scholars consider to be one of the oldest parts of the bible, suggests that Yahweh dwelt at Mount Seir, so many scholars favor a location in Nabatea (modern Arabia). Alternatively, the biblical descriptions of Sinai can be interpreted as describing a volcano, and thus a number of scholars have considered equating Sinai with locations in north western Saudi Arabia. Passages earlier in the narrative text than the Israelite encounter with Sinai indicate that the ground of the mountain was considered holy, but according to the rule of Ein mukdam u'meuchar baTorah—"[There is] not 'earlier' and 'later' in [the] Torah," that is, the Torah is not authored in a chronological fashion, classical biblical commentators regard this as insignificant. Some modern day scholars, however, who do not recognize the authority of the Oral Law, explain it as having been a sacred place dedicated to one of the Semitic deities, long before the Israelites had ever encountered it. Other modern biblical scholars regards these laws as having originated in different time periods from one another, with the later ones mainly being the result of natural evolution over the centuries of the earlier ones, rather than all originating from a single moment in time. In classical rabbinical literature, Mount Sinai became synonymous with holiness; indeed, it was said that when the messiah arrives, God will bring Sinai together with Mount Carmel and Mount Tabor, and then build the Temple upon the combined mountain, and the peaks would sing a chorus of praise to God. According to early aggadic midrash, Tabor and Carmel had previously been jealous of Sinai having been chosen as the place that the laws were delivered, but were told by God that they had not been chosen because only Sinai had not had idols placed upon it; Pirke De-Rabbi Eliezer suggests that God had chosen Sinai after discovering that it was the lowest mountain. According to the Biblical account of the law-giving, Sinai was enveloped in a cloud, it quaked and was filled with smoke, while lightning-flashes shot forth, and the roar of thunder mingled with the blasts of a trumpet; the account later adds that fire was seen burning at the summit of the mountain. Several scholars have indicated that it seems to suggest that Sinai was a volcano, although there is no mention of ash; other scholars have suggested that the description fits a storm, especially as the Song of Deborah seems to allude to rain having occurred at the time, with the fire possibly being some natural plasma effect. In the Biblical account, the fire and clouds are a direct consequence of the arrival of God upon the mountain. 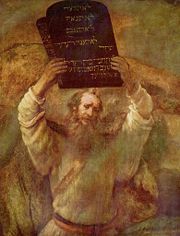 In a midrash, it is argued that God was accompanied by 22,000 archangels, and 22,000 divine chariots, and in order for all these to fit these onto the mountain, God made the mountain expand from its earlier size. The biblical description of God's descent superficially seems to be in conflict with the statement shortly after that God spoke to the Israelites from heaven; while textual scholars argue that these passages simply have come from different sources, the Mekhilta argues that God had lowered the heavens and spread them over Sinai, and the Pirke De-Rabbi Eliezer argues that a hole was torn in the heavens, and Sinai was torn away from the earth and the summit pushed through the hole. The summit of the mountain has a mosque and a Greek Orthodox chapel (which was constructed in 1934 on the ruins of a sixteenth-century church) neither of which are open to the public. The chapel supposedly encloses the rock from which God made the Tablets of the Law. At the summit can also be found "Moses' Cave" where Moses is supposed to have waited to receive the Ten Commandments. The Monastery of St. Catherine is situated at the foot of the adjacent mountain, Mount Catherine, at an elevation of around 1,200 meters. Modern scholars differ as to the exact geographical position of Mount Sinai, and the same has long been true of scholars of Judaism. 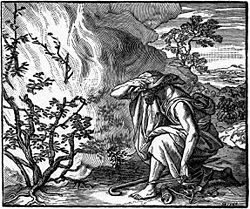 The intended location would obviously have been known at some point, and the Elijah narrative appears to suggest that when it was written, the location of Horeb was still known with some certainty, as Elijah is described as traveling to Horeb on one occasion, but there are no later biblical references to it that suggest the location remained known; Josephus only specifies that it was within Arabia Petraea, and the Pauline Epistles are even more vague, specifying only that it was in Arabia, which covers most of the southwestern Middle East. Various theories have been proposed regarding the location of the true Mount Sinai. These theories are outlined below. Traditionally, Christians have considered the Sinai Peninsula to be the authentic location of Mount Sinai, although it should also be noted that the peninsula gained its name from this tradition, and was not called that in Josephus' time or earlier (the Sinai was earlier inhabited by the Monitu and was called Mafkat or Country of Turquoise). In the first few centuries following Jesus' death, a number of Christian hermit monks settled on Mount Serbal, considering it to be the biblical mountain, and in the fourth century a monastery was constructed at its base. However, Josephus had stated that Mount Sinai was the highest of all the mountains thereabout, which would imply that Mount Catherine was actually the mountain in question if Sinai was to be sited on the Sinai Peninsula at all. In the sixth century, Saint Catherine's Monastery was constructed. 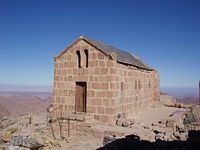 Unlike these Christian traditions, Bedouin tradition considered Jabal Musa, which lies adjacent to Mount Catherine, to be the biblical mountain, and it is this mountain that local tour groups and religious groups presently advertise as the biblical Mount Sinai. According to textual scholars, in the 'J' version of the Exodus narrative, the Israelites travel in a roughly straight line to Kadesh Barnea from the Yam Suph (literally meaning "the Reed Sea," but considered traditionally to refer to the Red Sea), and the detour via the south of the Sinai peninsula is only present in the Priestly source. A number of scholars and commentators have therefore looked towards the more central and northern parts of the Sinai peninsula for the mountain. Sin Bishar, in the west-central part of the peninsula, was proposed to be the biblical Mount Sinai by Menashe Har-El, a biblical geographer at Tel Aviv University. Mount Helal, in the north of the peninsula has also been proposed. On the north-east of the peninsula is a mountain named Hasham el-Tarif, which The Exodus Decoded (a James Cameron-produced History Channel special) suggested was the correct location because in addition to its geographic site, it also has certain other features that make it suitable; there is a cleft that overlooks a natural amphitheatre at which the Israelites could have been addressed by Moses; there is a nearby plateau on which the large numbers of Israelites could camp, with enough foliage for their flocks to graze; and there is evidence of an ancient spring. All of these locations are within modern Egypt, preventing archaeological excavation for any further evidence that might be present, because the Egyptian government closely guards, and often denies access to, any of the locations which may be related to Biblical history. In the case of Hasham el-Tarif, there is the additional obstacle that it is very near the border with Israel, and thus is in a highly sensitive military zone. 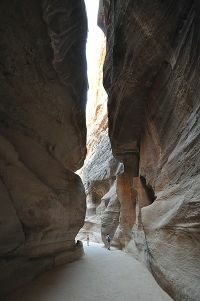 The Siq, literally ‘the Shaft’ is the main entrance to the ancient city of Petra in southern Jordan. Since Moses is described by the bible as encountering Jethro, a Kenite who was a Midianite priest, shortly before encountering Sinai, this suggests that Sinai would be somewhere near their territory the Kenites and Midianites appear to have resided east of the Gulf of Aqaba. Additionally, the Song of Deborah, which textual scholars consider one of the oldest parts of the Bible, portrays God as having dwelt at Mount Seir, and seems to suggest that this equates with Mount Sinai; Mount Seir designates the mountain range in the centre of Edom. Based on a number of local names and features, in 1927 Ditlef Nielsen identified the Jebel al-Madhbah (meaning mountain of the Altar) at Petra as being identical to the biblical Mount Sinai; since then, as well as a number of scholars, a number of unqualified amateur investigators such as Graham Phillips, Andrew Collins, and Chris Ogilvie-Herald have also made the identification. The biblical description of a loud trumpet at Sinai fits the natural phenomena of the loud trumpeting sound caused by wind being funneled down the Siq; the local Bedouins refer to the sound as the trumpet of God. The dramatic biblical descriptions of devouring fire on the summit;, would fit with the fact that there have been many reports and sightings of plasma phenomona at al-Madhbah over the centuries the pre-requisite that storm conditions exist before plasma phenomona usually occur would fit with the storm-like biblical description of thunder, lightning, and a thick cloud. The valley in which Petra resides is known as the Wadi Musa, meaning valley of Moses, and at the entrance to the Siq is the Ain Musa, meaning spring of Moses; the thirteenth-century Arab chronicler Numari stated was Ain Musa was the location where Moses had brought water from the ground, by striking it with his rod. The Jebel al-Madhbah was evidently considered particularly sacred, as the well known ritual building known as “The Treasury” is carved into its base, the mountain top is covered with a number of different altars, and over eight meters of the original peak were carved away to leave a flat surface with two eight-meter obelisks sticking out of it; these obelisks, which frame the end of the path leading up to them, and are now only six meters tall. Archaeological artifacts discovered at the top of the mountain indicate that it was once covered by polished shiny blue slate, fitting with the biblical description of paved work of sapphire stone; biblical references to sapphire are considered by scholars to be unlikely to refer to the stone called sapphire in modern times, as sapphire had a different meaning, and was not even mined, before the Roman era. Unfortunately, the removal of the original peak has destroyed most other archaeological remains from the late Bronze age (the standard dating of the Exodus) that might previously have been present. Instead of plasma effects, another possible naturalistic explanation of the biblical devouring fire is that Sinai could have been an erupting volcano; this has been suggested by Charles Beke, and Immanuel Velikovsky, among others. This possibility would exclude all the peaks on the Sinai Peninsula and Seir, but would make a number of locations in north western Saudi Arabia reasonable candidates. 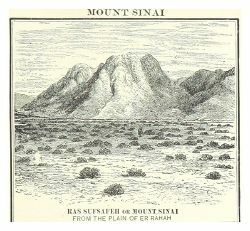 In 1873 Beke proposed that Sinai was the Jabal al-Nour (meaning mountain of light), a volcanic mountain at the northern end of the Gulf of Aqaba, and which has great significance in Islam for other reasons; Beke died during the following year, but posthumously retracted this identification four years later in favour of Jebel Baggir, with Horeb being argued to be a different mountain - the nearby Jebel Ertowa. Beke's suggestions have not found as much scholarly support. Assuming that Hrob is a corruption of Horeb, in the early twentieth century Alois Musil and H. Philby independently proposed that Al-Manifa, near the Wadi al-Hrob in north western Saudi Arabia, was Mount Sinai. A number of fundamentalist Christian apologists and pseudoarchaeologists, including Howard Blum and Ron Wyatt, have proposed instead that another volcano adjacent to Al-Manifa named Jabal al-Lawz was the Biblical Sinai. This claim has not been supported by any academically qualified biblical scholars or archaeologists; the archaeological remains at the site are no earlier than the second century B.C.E., according to archaeologists. While equating Sinai with Petra would indicate that the Israelites journeyed in roughly a straight line from Egypt via Kadesh Barnea, and locating Sinai in Saudi Arabia would suggest Kadesh Barnea was skirted to the south, some scholars have wondered whether Sinai was much closer to the vicinity of Kadesh Barnea itself. Half way between Kadesh Barnea and Petra is Jabal Ideid, which Emmanuel Anati excavated, and discovered to have been a major Paleolithic cult center, with the surrounding plateau covered with shrines, altars, stone circles, stone pillars, and over 40,000 rock engravings. The peak of religious activity at the site dates to 2350–2000 B.C.E., the exodus is usually dated between 1600–1200 B.C.E., and the mountain appears to have been abandoned between 1950–1000 B.C.E., Anati proposed that Jabal Idead was equatable with biblical Sinai. Other scholars have criticized this identification, as, in addition to being almost 1000 years too early, it also appears to require the wholesale relocation of the Midianites, Amalekites, and other ancient peoples, from the locations in which the majority of scholars currently place them. Ralph Ellis, in his books Tempest and Exodus and Solomon, Falcon of Sheba, asserts that the Great Pyramid of Giza is the actual Mount Sinai, and that the Ancient Israelites, in their avoidance of being equated with anything Egyptian, re-identified it. His theory is based on the ideas that Moses was commanded into the mountain (inside the Pyramid), and that Sinai is described as being a 'mountain in the desert'. ↑ Geology, AllSinai.info. Retrieved March 9, 2019. ↑ 2.0 2.1 2.2 2.3 2.4 2.5 Cheyne and Black, Encyclopedia Biblica. ↑ 3.00 3.01 3.02 3.03 3.04 3.05 3.06 3.07 3.08 3.09 3.10 Joseph Jacobs, M. Seligsohn and Wilhelm Bacher, “Mount Sinai,” Jewish Encyclopedia. Retrieved March 9, 2019. ↑ Rebbe Nachman and Chaim Kramer, This Land Is My Land (Breslov Research Institute, 2002, ISBN 978-0930213183). ↑ 5.0 5.1 5.2 Charles Beke, Mount Sinai, a Volcano (1873). ↑ Pirke De-Rabbi Eliezer, 14. ↑ 15.0 15.1 15.2 15.3 15.4 15.5 Matthew Black (ed. ), Peake's Commentary on the Bible (London: Routledge, 2001, ISBN 0415263557). ↑ 17.0 17.1 17.2 17.3 17.4 17.5 Graham Phillips, The Templars and the Ark of the Covenant: The Discovery of the Treasure of Solomon (Bear & Company, 2005, ISBN 1591430399). ↑ Mekhilta on Exodus 20:2-24. ↑ Pirke De-Rabbi Eliezer, 41. ↑ Martin Gray, Mount Sinai, Egypt, Sacred Sites: Places of Peace and Power. Retrieved March 9, 2019. ↑ “Sinai,” Catholic Encyclopedia. Retrieved March 9, 2019. ↑ Richard Elliott Friedman, Who Wrote the Bible? (New York: HarperOne, 1997, ISBN 0060630353). ↑ Ditlef Nielsen, The Site of the Biblical Mount Sinai – A Claim for Petra (1927). ↑ Charles Beke, Sinai in Arabia and of Median (1878). ↑ Howard Blum, The Gold of Exodus (Pocket, 1999, ISBN 978-0671027322). ↑ Emmanuel Anati, The Riddle of Mount Sinai: Archaeological discoveries at Har Karkom (2001). ↑ 41.0 41.1 Emmanuel Anati, Mount Sinai has been found: Archaeological discoveries at Har Karkom, HarKarkom.com. Retrieved March 9, 2019. ↑ Ralph Ellis, Tempest & Exodus: The Biblical Exodus Inscribed Upon an Egyptian Stele (Edfu Books, 2001, ISBN 0953191389). Anati, Emmanuel. The Riddle of Mount Sinai: Archaeological Discoveries at Har Karkom. , Studi Camuni 21 (Valcamonica [Brescia]: Edizioni del Centro, 2001. This page was last modified on 23 March 2019, at 15:57.